Update: Google My Business changes have resulted in some unreliability with this method of UTM tagging location links. Because these links seem to get scraped and copied/pasted around the web, I’m not recommending this method moving forward. Use the My Business dashboard to see reports from Google about local listing click data. This way, your Google Analytics data will remain reliable. Your GMB page is likely sending a lot of website traffic from Google Search, but how much? And how does this traffic behave past the first click? This subject overlaps a bit into Google Analytics. You can manually tell Google Analytics where a click came from by adding what’s known as UTM tags. 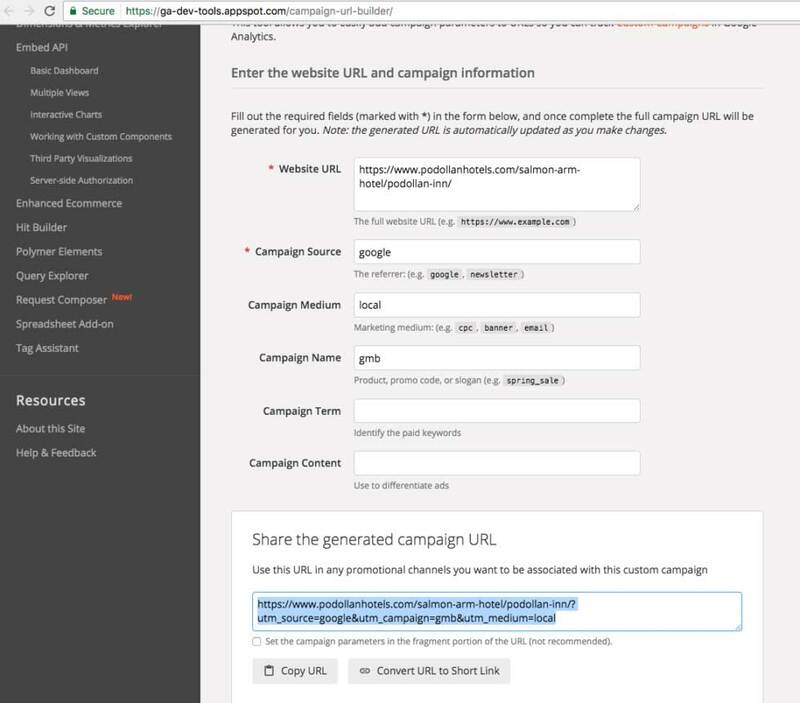 Google provides a tool for creating UTM tagged URL’s, to accurately identify traffic sources when using Google Analytics. In the example we will use the “source” “medium” and “campaign” to identify our traffic in Google Analytics. You can test this by pasting your UTM URL into your browser to load the page, then use real-time Analytics to make sure your UTM tags are working properly. Check “Traffic Sources” to identify your active session with the correct “Source” and “Medium” titles. Now you can place the same URL in the “website” field inside your GMB page and your done! It may take up to 24 hours to be updated in Google Search so check back later if you don’t see it right away. Note: If your page verification is pending, no changes made to your GMB will be updated in Google search until the page is verified. Google will send a postcard with a PIN to verify, or sometimes it can be done by phone. One strange thing I noticed when doing this last year is, the traffic from Google / Organic dropped significantly THE DAY I ADDED THE UTM LINK while the traffic from Google my business UTM Link increased. When I add them together, it equals normal traffic from Google organic….have you seen this? Yes that makes sense, since by default Google includes MyBusiness traffic as Google / Organic in Analytics. I’m not recommending UTM tagging MyBusiness links anymore. Have you found a way to segment it in the Organic traffic? I’ve tried a few things but haven’t found anything of much use yet.